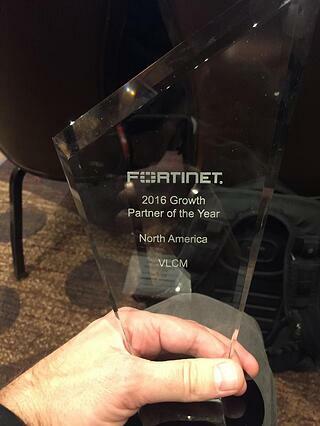 Salt Lake City, Utah January 16, 2017 — VLCM announced today that it was named Fortinet’s 2016 North America Growth Partner of the Year. VLCM was honored during Fortinet’s Accelerate 2017 global partner conference, an annual gathering of more than 1,300 top partners from around the globe. Fortinet's 2016 Partner of the Year awards recognize outstanding cybersecurity sales, customer experience, collaboration, and marketing achievements from the company's distributors and resellers around the world. VLCM saw 113 percent growth and 30 Cyber Threat Assessment Program sign-ups with Fortinet in the past year. VLCM is excited to be recognized as a strong Fortinet partner and we look forward to several more productive and successful years to come. Accelerate 2017 offers a unique opportunity for partners and customers to gain insights about Fortinet’s Security Fabric vision, provide direct feedback to Fortinet leadership, learn to maximize Fortinet’s enablement programs, and gain and share best practices with the cybersecurity industry’s best and brightest. You can learn more details about the Fortinet Partner program here. VLCM is a leading IT provider for the Rocky Mountain Region, with offices in Salt Lake City, Lehi, St. George, Boise, Denver, and Albuquerque. VLCM provides end-to-end, customized IT solutions for both public and private sectors. Their 3-decades of expertise has landed VLCM in the CRN MSP 500 and Tech Elite 250 lists, the Utah Fast 50, and more. Fortinet (NASDAQ: FTNT) secures the largest enterprise, service provider, and government organizations around the world. Fortinet empowers its customers with intelligent, seamless protection across the expanding attack surface and the power to take on ever-increasing performance requirements of the borderless network - today and into the future. Only the Fortinet Security Fabric architecture can deliver security without compromise to address the most critical security challenges, whether in networked, application, cloud or mobile environments. Fortinet ranks #1 in the most security appliances shipped worldwide and more than 290,000 customers trust Fortinet to protect their businesses. Learn more at http://www.fortinet.com, the Fortinet Blog, or FortiGuard Labs.